If you've dreamed of a giant bag full of all your favourite sour sweets then Waterbridge Mega Funmix Sour is for you! 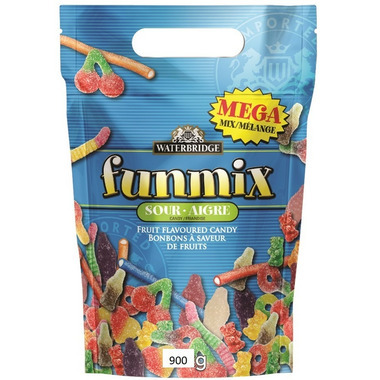 Filled with delicious tang treats, this mix contains a mouth-watering assortment of Waterbridge FizzyPop bottles, sour Funstix, and a collection of sour gummy shapes like bears, sour keys, cherries and more! The resealable bag and convenient carrying handle makes this mix perfect to bring with you on the go! Ingredients: Sugar, Glucose-Frutose Syrup, water, Modified Potato Starch, Gelatine, Citric Acid, Corn Strach, Scorbitol, Modified Tapioca Starch, Concentrated Grape Juice, Wheat Flour, Dextrose, Fumeric Acid, Lactic Acid, Mono and Diglycerides, Natural and Artificial Flavours, Colour, Malic Acid, Palm Fat, Sodium Bicarbonate, Sodium Citrate, Gum Arabic. Contains Wheat. May contain Tree Nuts and Sesame.